Breathable Basket - Our choice is a plastic, grocery-type basket with many holes in it. We selected a red basket so it's easy to spot if we forget where we set it down! The holes allow air to freely circulate around the mushrooms, helping to keep them in prime condition. Bear Repellent Spray - We always carry this in our basket, not knowing what animal we might encounter in the forest. Compass - We check our compass before entering an area, even a well known area, so that we always know how to come out of the area. Knife - Even if we don't intend to cut the mushrooms, we find that having a knife is handy. For example, it can be used to scrap away debris, cut up an apple for a snack, etc. Mushroom Diary - We keep detailed notes of what we picked, when and where in a loose-leaf, pocket size binder that allows us to arrange the pages in date order. Being able to compare the forays from year to year is invaluable information for future outings, and enhances our knowledge of mushrooms! Paper Bags - When we come upon an interesting mushroom that we don't recognize, it goes straight into the paper bag for immediate isolation and later identification. Plastic Bags - Be a good citizen! Pick up trash and carry it out of your gathering spots! Whistle - Long before we acquired walkie talkies, whistles were our mode of communication. One whistle meant: where are you? Two whistles meant: let's go, I'm ready to try another spot. And, three whistles meant: come see what I found! Walkie Talkies - The whistles served us well for many years, and we still use them for backup when batteries start to fail. Walkie talkies, of course, are great because they allow extended communication rather than the one, two or three whistle blasts. Mushrooms Demystified (David Arora, Ten Speed Press, 1986) - an incredible resource for the more curious and advanced mushroomer. Mushrooms, Poisons and Panaceas (Dr. Denis R. Benjamin, W. H. Freeman & Company, 1995) - an invaluable handbook for naturalists, mycologists, physicians - a good read for ordinary folks, too. Mushrooms of the Pacific Northwest (Steve Trudell & Joe Ammirati, Timber Press Field Guide, 2009) - over 500 color photographs and straight forward keys for identification make this a great resource. The New Savory Wild Mushroom (Margaret McKenny & Daniel Stuntz, revised by Joseph Ammirati, University of Washington Press, 1987) - not only a wonderful guide to local mushrooms packed with essential information and colorful photographs but also easy to use in the forest. The Mushroom Feast (Jane Grigson, Alfred A. Knopf, 1975). Fly Amanitas are a colorful (but poisonous!) addition to the forest floor! We are not degreed mycologists. We consider ourselves to be experienced mushroomers. We have learned to recognize with absolute certainty a couple of dozen species which are safe edibles that we enjoy, and those are the ones we gather. We also recognize a hundred or so others that interest us for some reason, usually their unusual beauty, but either we don’t particularly like their flavor, don’t know they are safe to eat or, more directly, know they are unsafe to eat. We may take them home (carefully segregated from the others, in their own container) for further study or observation or even to be photographed, but we never even remotely consider putting one in our mouths. 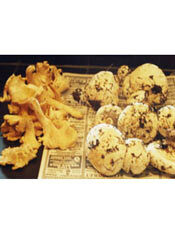 The old adage, “Every mushroom is edible…once” is a good one for wild mushroomers to mind. Our best advice to beginning mushroomers is to choose one or, at most, two species of good edible wild mushrooms at the start of a season. On every foray, focus on only those. Learn everything you can about them: what they look like at every stage of their development, what they smell like, where they are found, what trees they seem to grow near, what elevation, what the soil is like, etc. Take good notes in a pocket field journal as to when and where found, what the weather has been like, and so on. At the end of the season, you should really know that species. Next year, add another species or two. In this way, you will gradually develop a wealth of knowledge that will be satisfying and will keep you safe. You will also have a written record of your experience on previous forays, which can help you pinpoint likely spots on just the right weekend. All decent mushroom guides discuss mushroom poisons. Refer to them, and believe them. Here are some further thoughts. Even though you are absolutely certain of your identification of a species, sample it in small amounts first, rather than stuffing yourself. We know it can be tempting to make a big feast of them, but use caution. Some wild mushrooms classed as safe edibles can cause temporary - but sometimes severe - stomach upset in some people but not in others. Ease your way into this. 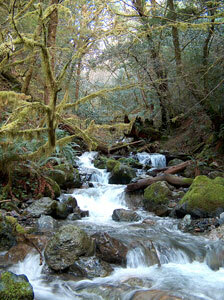 Think about where you are gathering mushrooms, too. If you find a patch of mushrooms growing by a busy highway, for example, you might be certain that your identification of them as an edible is accurate, but what you don’t know is the amount of run-off from the road they have absorbed. Oil, gasoline, antifreeze, etc. invariably leaks onto highways and runs to the shoulders. Are you sure you want to risk that? Areas that have recently been sprayed with herbicides or pesticides are another thing to consider. Our intent here is not to scare you, but just to make you think carefully about what you’re doing, and use reasonable prudence. 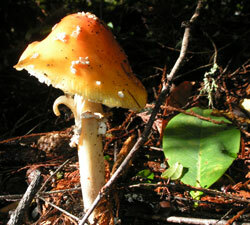 Wild mushrooms should never be eaten raw; always cook them thoroughly. Some mushrooms are very toxic when raw (one good example is morels, of all types) and will sicken almost everybody; morels and some others lose all this toxicity in the cooking process and are perfectly safe to eat when cooked (note: dehydrating or freezing is not a substitute for cooking!). Mushrooms do not degrade from cooking and, in fact, their flavor is always improved with proper cooking in butter or olive oil and the accompaniments you like, such as garlic, wine, various spices and seasonings. Experiment, and try different recipes. That’s part of the fun. The Puget Sound Mycological Society, in which we were active members for many years when we lived in the Seatle area, had an annual wild mushroom dinner they called “the Survivors’ Banquet,” in mock celebration of having survived another year of eating wild mushrooms. Among experienced mushroomers, there is a certain amount of “gallows humor” about mushroom poisonings, and that’s not bad. It heightens our awareness, and that’s a good thing. We have been eating the wild mushrooms we gather for many years and even providing some to a few close friends with absolute confidence… but that confidence is not macho posturing, but rather the result of learning and knowing. You can do the same. 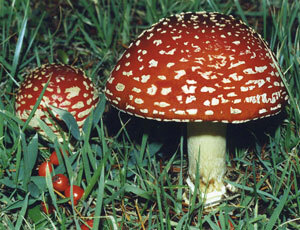 Be cautious: some mushrooms are look alikes! 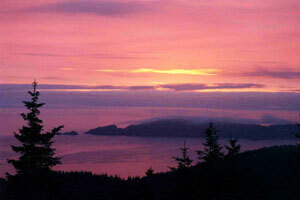 Sunset is a perfect time to preserve the day's bounty! Collect only as many mushrooms as we can reasonably process within a few days. Only preserve mushrooms that are in very good condition and that are thoroughly cleaned. Spread on a wire screen over a heat register. Lay in a single layer on newsprint and turn daily until thoroughly dry. Caution: Do not dry in an oven, which tends to make them extremely hard and very difficult to re-hydrate! When thoroughly dry, place in a tight sealing container and freeze for one week. Freezing kills any microscopic bugs that made it through the dehydration process. Then remove from freezer and store in a dry place. To re-hydrate, soak in warm water for 15 minutes. We successfully dry: morels, boletes, puffballs, matsutake, cauliflowers, corals, oysters. Caution: The Bay Area Mycological Society recommends drying mushrooms away from your main living area because "dehydrators blow a high volume of spores into the air"...and "some people have developed allergies from breathing this effluent." Sauté mushrooms in a small amount of butter or olive oil. Cool and pack in freezer bags or plastic containers. Steam over a small amount of boiling water for 10 minutes in a spaghetti cooker or similar pot. Cool. Pack into containers. Cover with liquid that has been extracted from the mushrooms and seal. We successfully freeze: chanterelles, pig’s ears, morels, verpa, matsutake. According to the publication PNW172, which is published by Pacific Northwest Extension, "There is no research-based processing time for wild mushrooms. Since wild mushrooms have a different texture from commercially grown mushrooms, the processing time for purchased mushrooms does not apply to wild mushrooms." Publication SP 50-919, revised January 2010 and issued by Oregon State University Extension Service, cautions "Unless you are an expert in mushroom identification, it is advisable to only preserve commercially sold mushrooms." OSU's Publication SP 50-494 adds the following cautions about using canned foods: "Examine all canned foods before using them. (1) Inspect the can or jar before opening...Metal lids should be firm and flat or curved slightly inward. There should be no signs of leakage around the lid, rubber ring or elsewhere. (2) As the can or jar is opened, notice whether there is an inrush or an outrush of air. Spoilage is indicated when air rushes out or the liquid spurts. (3) Smell the contents at once. The odor should be characteristic of the food. An "off" odor probably means spoilage. (4) Check the food carefully to see that it appears to have characteristic texture and color...Liquids in all foods should be clear. Any change from the natural texture and color indicates spoilage. Do not taste any questionable foods. (5) Discard canned food with signs of spoilage...Spoiled low acid food (such as vegetables, meat, fish, and poultry) must be discarded more cautiously because it could contain botulinal toxin." Please see the publication for additional information. Some years ago, the Puget Sound Mushroom Society of Seattle, Washington, published canning information for wild mushrooms, and we are passing it along for your consideration. In the past, we have preserved mushrooms using this method, but believe that you must decide for yourself if, after considering the possible risks, you wish to can mushrooms. On a personal note, Steven and I no longer can mushrooms for a variety of reasons, including food safety and quality of product. Truthfully, we feel that dehydrated and frozen mushrooms are a far superior product to canned mushrooms. They are also less work, and take up less room in your pantry. 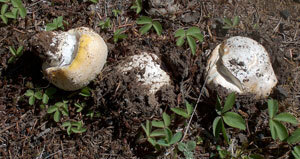 Leave small button mushrooms whole; halve or slice larger specimens. Steam over a small amount of boiling water for 10 minutes. Pack into hot, clean pint or half-pint canning jars. Add ½ teaspoon salt to each pint and 1/4 teaspoon salt for each half-pint. Cover with liquid extracted from the mushrooms, leaving ½ inch headspace. Adjust lids and process in pressure cooker at 10 pounds for 30 minutes for either half-pint or pint jars. PSMS recommended canning: matsutake, russulas, cauliflowers, oysters, agaricus, chanterelles, hedgehogs, pig’s ears. cooked mushrooms and simmer until liquid is reduced to ½ cup. Combine this liquid with the previously drained liquid and cook over low heat until liquid is reduced and extract thickens slightly. Put in a small jar and refrigerate. Use in seasoning gravies, sauces, soups, meats and poultry dishes. Place in a very large kettle: 3 quarts sliced and blanched chanterelles, 2 cups chopped white onions, 2 cloves garlic, ¼ cup minced parsley, 1 bay leaf, 6 coarsely ground peppercorns, 1 ½ tablespoons salt, 2 tablespoons sugar, 1 tablespoon tarragon, 4 cups dry white wine, 3 cups white vinegar, 1 cup lemon juice, 1 cup olive oil. Stir to mix. Bring to boil and simmer 20 minutes. Put into sterilized pint jars. Seal. Put in a boiling water bath 15 minutes. Makes 8 pints. Age 2 months before opening. Blanch cleaned, small whole mushrooms in boiling water 5-6 minutes and then wash thoroughly in cold water. Drain and cool mushrooms. Place mushrooms in a crock, heads down. Place in layers of 2-3 inches. Sprinkle with salt (1 ounce per pound of mushrooms). Add pickling spices. Cover with cold water. Cover crock with lid, held down firmly with a clean, heavy object. Serve in a month. Place 5 quarts of sliced mushrooms, 2 sliced onions, 10 cloves, 1 ounce powdered mace and 2 teaspoons white pepper in large shallow pan. Put over low heat until the mushroom juices run. Then raise the heat so that the juices can evaporate, stirring continuously to that the mushrooms and onions do not burn. Spread onto baking trays and dry in a 200-degree oven. When perfectly dry, crush or grind to a powder and store in an airtight container. Add to soups and sauces just before serving. Chop 3 pounds of mushrooms, spread out in a large bowl, and sprinkle with 6 tablespoons salt. Leave, covered, for 2 days, stirring and squashing them occasionally. Place mushrooms in saucepan, and add 2/3 cup wine vinegar, 2 teaspoons chopped onions, 1 teaspoon peppercorns, 1 teaspoon allspice, ½ teaspoon mace, ½ teaspoon whole cloves, and ½ inch piece cinnamon. Simmer 2 hours with no lid on pan. Liquor will concentrate to a good strong flavor. Pour through a cloth into hot sterilized bottles and seal immediately. Pleurotus Cornicopiae (Golden Oysters) - Produces clusters of small to medium size yellow mushrooms.